During a recent training class I conducted, a Millennial employee vented to me that what she heard most often from older workers was “No, we can’t do it.” She was frustrated by their apparent lack of openness to new ideas, particularly in one situation in which her proposed solution to an existing problem was initially shot down in this manner but was later adopted after further discussion within the department. This is an all-too-common scenario in which the initial “no” from older workers is not so much a rejection of an idea but a rejection of how a younger worker has presented it. Such conflict arises not only from differences in age but from differences in tenure, too: a recent hire might enter a workplace ready to turn the system around, only to have his or her ideas shot down by long-term employees who’ve been at the company for years. Seasoned employees need to be more open to ideas and appreciate the enthusiasm that young employees and new hires bring to the table instead of outright rejecting their suggestions (even if those ideas have been tried before). Because they’re new to the workforce, everything is still exciting to them. Remember feeling fresh and being eager to contribute when you first joined the workforce or your organization? Chances are you often came up with lots of great new ideas—just as Millennials do today. Sometimes all that’s needed to reveal a solution to an existing problem is a new perspective and some perseverance. Just because an idea has already been explored doesn’t mean all possible approaches have been exhausted. Consider the example of Thomas Edison, who famously quipped, “Many of life’s failures are people who did not realize how close they were to success when they gave up” just a few years before he finally succeeded (after several hundred—or, by some accounts, several thousand—failed attempts) in creating a long-lasting light bulb. When a younger worker expresses an idea that has already been explored, instead of dismissing the proposal with a “Been there, done that” response, the more seasoned employee should instead try to analyze it in light of past approaches. Discussing prior efforts, sharing documentation of them (such as reports and e-mail), and pointing the younger employee to those who’ve worked on the problem before can yield fresh perspectives that might enable the office’s new blood to see a way around obstacles that stymied others in the past. After all, if an idea was great when it was first brought up, why not help someone else finally figure out a way to achieve that goal? The worst that can happen is the idea fails again. But in the best-case scenario, everyone involved—both the new employee and the veteran—comes out smelling like roses. By not killing ideas immediately and instead providing support for them, you can encourage younger workers to keep coming up with those new ideas—and even mistakes can often lead to completely new solutions. (For example, Post-its were developed when a 3M chemist’s attempts to create a super-strong adhesive resulted instead in the weaker yet reusable glue that eventually allowed those little yellow rectangles to become ubiquitous in the office). Remember the big picture, in which the company’s success is the end goal. Fostering new ideas and new strategies for achieving that goal will help ensure the organization’s longevity for years to come. If you hear your workers respond, “That can’t be done” right off the bat when hearing a new employee’s ideas, step in and encourage an open dialogue that transforms “That can’t be done” into “That might be possible—but be prepared to encounter the following roadblocks with this approach.” You’ll not only better equip everyone for success but also come across as an approachable, sensible leader who inspires employees. Of course, not every idea can be pursued (for lack of resources, financing, or staffing, among other reasons). But when you must reject a younger employee’s proposal, be sure to explain clearly the reasoning behind the decision so that person can be better prepared the next time he or she presents an idea. Just as more experienced workers need to embrace the enthusiasm and new ideas of new recruits, younger employees also need to learn how to see things from the perspectives of their more seasoned colleagues. 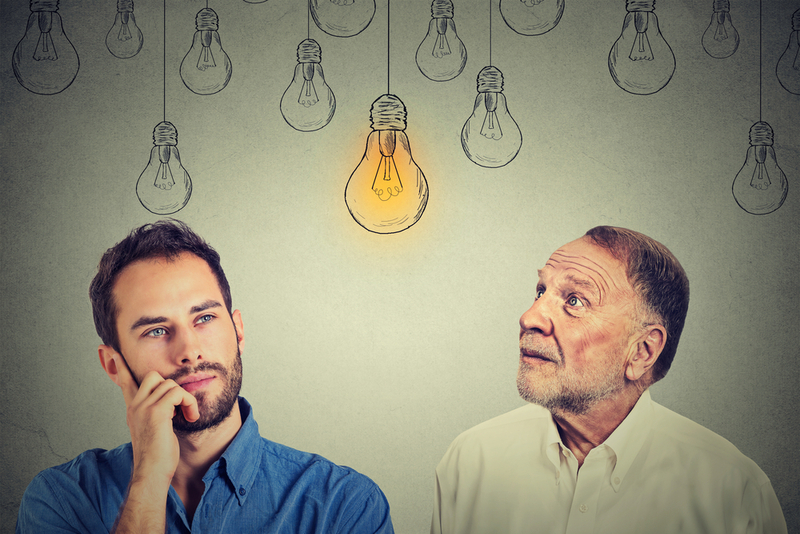 In some cases, for example, a workplace veteran might take a suggestion as a personal affront by the younger coworker: the older worker thinks that the younger one assumes that no one has thought of that idea before. This often happens when younger workers enthusiastically present their great solutions for problems without taking into consideration the older employees’ experience (and the fact that they may have also tried to tackle those problems themselves). Should older workers be less sensitive? Of course. (In fact, it would be great if everyone stopped taking things so personally!) But look at the situation from their point of view: they (like everyone else) want to be valued for their experience and what they bring to the table. Taking the approach of enlisting help from all team members (regardless of age) means welcoming all input—and finding value even in the negative stuff. After all, knowing what’s been tried without success before may cut down on the time spent to find a winning solution on the next go-around. Encourage employees to treat a no as an opportunity to understand their colleagues’ objections and therefore make their case even stronger the next time. If you’re the Millennial who’s pitching new ideas, don’t get offended when someone (of any age) tells you no. Instead, ask for more information about why something can’t be done. If an older employee responds, “We already tried it,” push for more information about past efforts. Treat the experience as an opportunity to learn about how the problem was approached in the past so that you don’t waste your time repeating a failed methodology and end up with the same result. As you pitch ideas for improving operations, keep in mind that someone who’s currently in your company (or even your group) may be the person who implemented the practices you’re trying to change. Criticizing an idea while suggesting an alternative that you think is better may incense him or her to the point of being unable to listen to new ideas. That actually happened to me early in my career, when I made some derogatory comments about the system my department used to track customers—only to find out that my boss was the one who had originally rolled it out. He was so irritated by my comments that he immediately rejected my suggestion to switch to a better system, and there was tension on both sides. Fortunately, my boss was an outstanding mentor: rather than deride my actions during that meeting, he taught me to leave personal judgments out of my professional presentations and instead to focus on how my new ideas can help the company achieve its goals. That’s a lesson of value to employees and managers of all ages. Everyone needs to learn how to avoid emotional reactions during business discussions and keep the conversation centered on problem solving—an approach that will yield great results. Valerie M. Grubb of Val Grubb & Associates Ltd. (www.valgrubbandassociates. com) is an innovative and visionary operations leader with an exceptional ability to zero in on the systems, processes, and personnel issues that can hamper a company’s growth. Grubb regularly consults for mid-range companies wishing to expand and larger companies seeking efficiencies in back-office operations. She can be reached at vgrubb@valgrubbandassociates.com. More articles like this from our magazine, HR Insights, can be viewed online on our website. Excerpted and adapted for this publication with permission of the publisher, John Wiley & Sons Inc., from Clash of the Generations: Managing the New Workplace Reality, by Valerie M. Grubb. Copyright© 2017 by Valerie M. Grubb. All rights reserved.